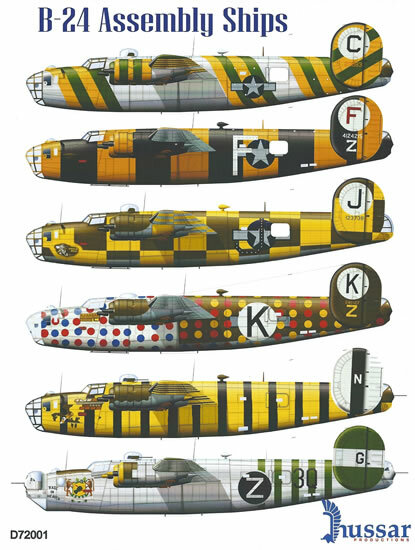 Decals and for six aircraft (in some cases the same aircraft has painting & markings variations for different time periods). Available on line from AirConnection for Can$24.99. Waterslide decals, vinyl masks, colour instruction booklet. Some very eye-catching schemes that appear to be well researched. Decals appear faultless and come with attractive and useful instructions. The masks are helpful, but really only apply to one option. None apparent with the product, but perhaps more information on the modified gun turrets and ID lights that apply to some options would have been helpful. This is a beautifully produced and presented set of decals that appear to be of the highest quality. Potentially some very eye-catching and quite stunning models could result. It would have been helpful to have a bit more information on “Wham Bam’s” tail turret replacement, and also on the particulars of the ID-lights, but this is a minor quibble given the overall standard of the package – Recommended. Hussar Productions are known for their range of military vehicle wheels and accessories as well as vehicle and aircraft decals. As far as I’m aware the decals reviewed here are their first in the “One True Scale” - 1/72. Searching the web soon reveals discussion and listings of Hussar Productions’ range, but stockists were hard to find. They are, however, available from AirConnection's online store. 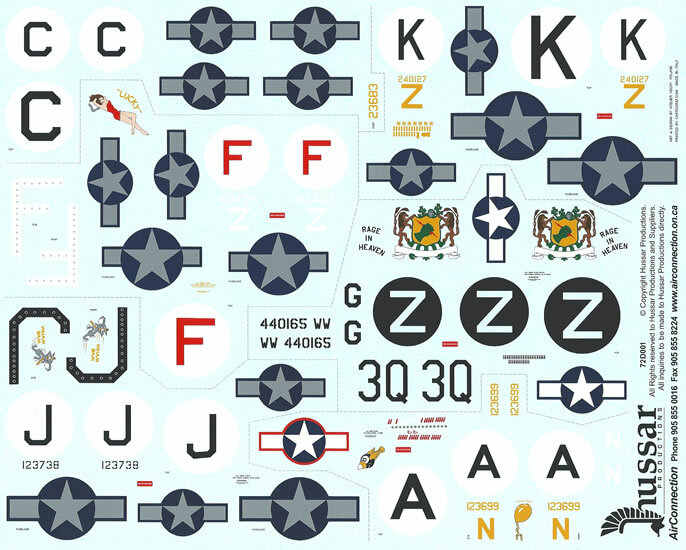 The decals come in a large zip-lock plastic bag enclosing an A-4 sized instructional booklet featuring the assembly ship schemes that are covered along with a similar sized sheet of decals. 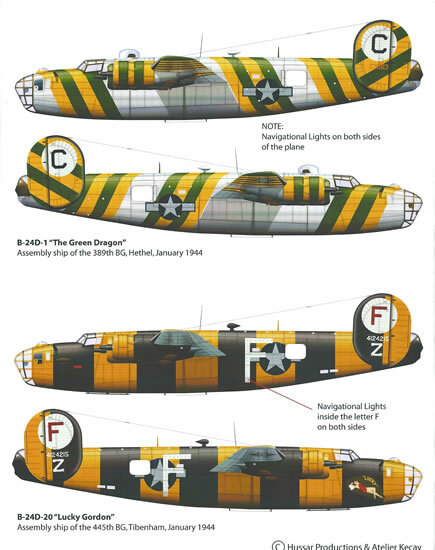 B-24D-1 "Green Dragon" 389th BG, Hethel, January 1944. B-24D-20 "Lucky Gordon" 445th BG, Tibenham, January 1944. 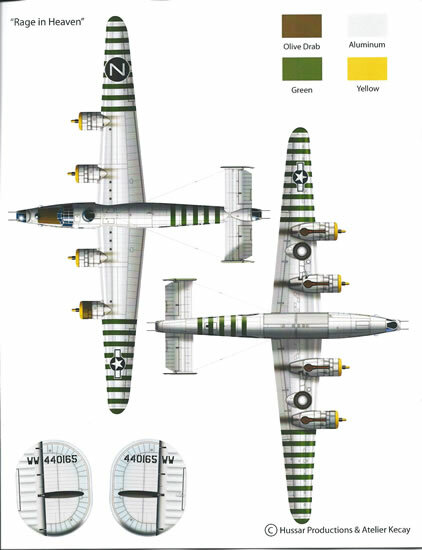 B-24D-1 "Wham Bam" 453rd BG, Old Buckenham, February 1944 (alternate option without ID-light illuminated recognition-letter “J”). B-24D-30 "First Sergeant" 458th BG, Horsham St. 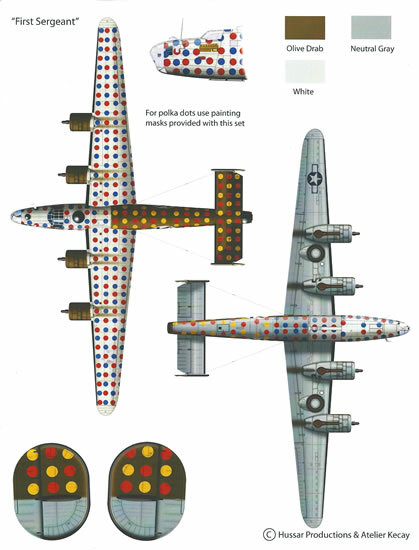 Faith, February 1944 (alternate option of pre-polka dot scheme). 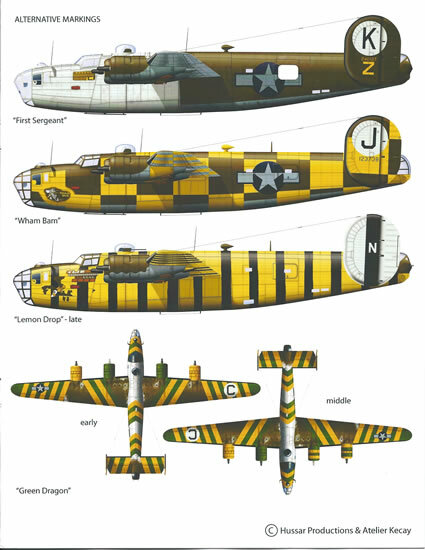 B-24D-1 "Lemon Drop" 44th BG, Shipdham, February 1944 (alternate options for early, middle and late versions of this scheme). B-24J "Rage in Heaven" 491st, North Pickenham, September 1944. The painting & markings guide is beautifully produced in glossy colour. Paint colours are by name only without FS codes, but this is of little consequence. In some cases major staining and weathering is also illustrated. The instructions show variations in gun armament for each aircraft as well as modified upper and tail turrets applicable to some choices. “Wham Bam” had its tail turret replaced with what appears to be a glazed and non-rotating enclosure. This is only partially illustrated in profile, so builders of this version will need to do some more research to guide scratch-building this feature. Several of the assembly ships had additional ID lights along fuselages or within their large recognition letters painted on the fuselage sides. The former have their positions identified in the instructions, and the latter are simulated within the decals themselves. What is unclear however is whether these lights were flush or raised, so some may wish to do more research in this area. 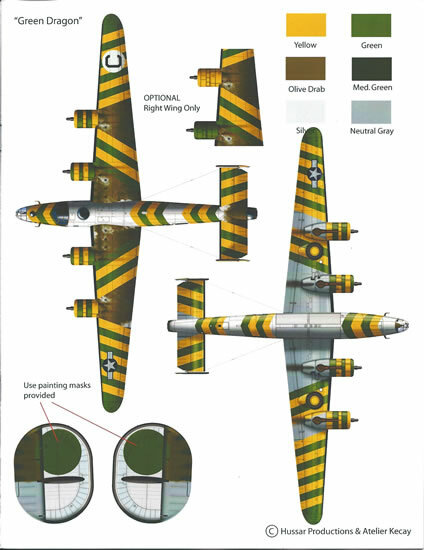 The vinyl masks largely relate to one scheme, “First Sergeant” and cater for the numerous polka dots worn by this aircraft after initially serving with just the forward fuselage painted white. The only other masks are two circles to mask the green disks on the tail of “Rage in Heaven”. I can’t but help think that this decal set is ideal for a group build, although lots might have to be drawn in the case of some schemes. This said; you get a lot for your money in my opinion, so buying a set just for yourself is not too extravagant either. 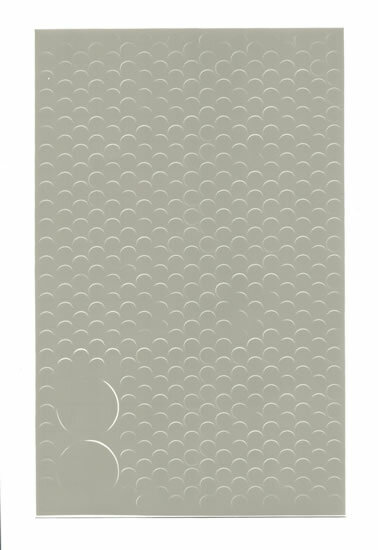 This is a beautifully produced and presented set of decals that appear to be of the highest quality. Potentially some very eye-catching and quite stunning models should result from using this set. It would have been helpful to have a bit more information on “Wham Bam’s” tail turret replacement, and also on the particulars of the ID lights, but this is a minor quibble given the overall standard of the package. A great buy for a group build (providing you can agree on who does which scheme), so team up with some mates and order a set, or just get a set for yourself anyway. They're good value either way. It should come as no surprise that I’m recommending these.